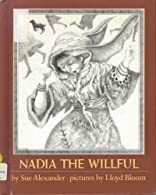 When her favorite brother disappears in the desert forever, Nadia refuses to let him be forgotten, despite her father's bitter decree that his name shall not be uttered. About Lloyd Bloom (Illustrator) : Lloyd Bloom is a published author and an illustrator of children's books and young adult books. Some of the published credits of Lloyd Bloom include Anna's Corn, Yonder, Like Jake and Me. This story first came to my attention at Callanwolde Fine Arts Center in Atlanta, when Milbre Burch, a storytelling colleague, introduced it with poignant success at a storytelling concert, back in the late 1980s. I still remember how she explained her rehearsal technique: "I at first ran around, yelling and screaming, as I envisioned Nadia would have done. Then I realized it was much more effective to sit simply, hands in lap, and recount the pain and anguish Nadia felt in not being able to speak her brother's name." WOW! Talk about effective! That story has stayed with me for lo! these 20+ years.... Now, that's effective writing....and storytelling.